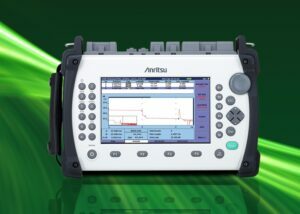 As part of Anritsu’s CMA5000a Multilayer Test Platform, the OTDR application reduces the time to install, commission, and maintain fiber spans via high performance hardware and easy-to-use software. Featuring support for a multitude of single mode and multimode wavelengths, up to 50 dB of dynamic range, and deadzones as small as 1 meter, the OTDR application is the ideal solution for testing long-haul backbone networks, metropolitan optical networks (MONs), and FTTP deployments that incorporate passive optical networks (PONs). 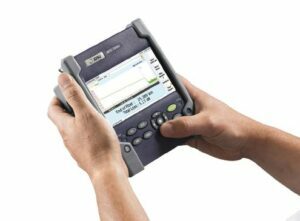 The Anritsu CMA5000a Optical Time Domain Reflectometer (OTDR) reduces the cost of measurement through ultra-fast data acquisition. Up to 80% of the dynamic range is achieved in under 30 seconds, saving valuable time and expense when compared to other solutions that require three minutes to complete their tests. In addition, real time updates of 1/10 second provide quick information for easier connector and splice optimization. The Anritsu CMA5000a OTDR Application provides unparalled ease of use for both the novice and the fiber expert through dedicated test modes that simplify and automate tests for any application from fiber reel validation measurements to long-haul, metro, or PON applications. In addition, tri-wavelength OTDR modules simplify multiple band fiber characterization covering O-, S-, C-, and L-band, while adding Loss Test Set and Visual Fault Locator (VFL) functions to the OTDR module further reduce inventory and enhance portability. The Anritsu CMA5000a Optical Time Domain Reflectometer (OTDR) application, when combined with the Polarization Mode Dispersion, Chromatic Dispersion, ORL, and Video Inspection Probe applications, becomes the most comprehensive fiber characterization tool available. Contact TestWorld today for the best price on the Anritsu CMA5000a Optical Time Domain Reflectometer (OTDR). A TestWorld representative will provide price & availability ASAP. Copyright 2015, TestWorld Inc. All rights reserved.